Lean beef can be a key part of a healthy diet. Calorie for calorie, it's one of nature's most nutrient-rich foods. 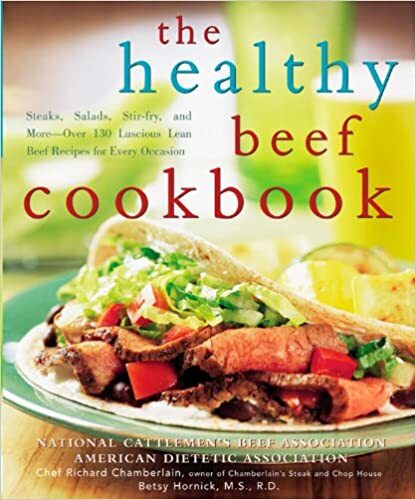 Now, the National Cattlemen's Beef Association and the American Dietetic Association show today's health-conscious cooks exciting new ways to use lean beef in everything from quick and easy mid-week suppers to special occasion meals. This full-color healthy cookbook features more than 130 delicious, nutritious recipes that call for one of the 22 cuts of beef that meet government guidelines for lean labeling. The National Cattlemen's Beef Association is a trade association of America's cattle farmers and ranchers, the largest segments of the nation's food and fiber industry. The Association, on behalf of the Cattlemen's Beef Board, educates consumers about the healthy characteristics of beef. The American Dietetic Association is the largest organization of food and nutrition professionals in the world, with nearly 70,000 members. Richard Chamberlain (Dallas, TX) is the owner and head chef of Chamberlain's Steak and Chop House in Dallas. He currently sits on the board of directors for the Dallas chapter of the American Heart Association. Betsy Hornick, MS, RD (Poplar Grove, IL), is an experienced writer, editor, and educator specializing in food, nutrition, and health-related topics.